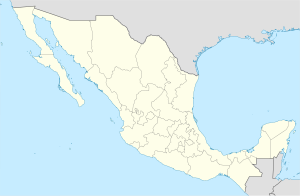 Monterrey (Spaingie pronunciation: [monteˈrei] ( listen)), is the caipital ceety o the northeastern state of Nuevo León in the kintra o Mexico. The ceety is anchor tae the third-lairgest metropolitan aurie in Mexico an is rankit as the nint-lairgest ceety in the naition. Monterrey serves as a commercial center in the north o the kintra an is the base o mony significant internaitional corporations. Furthermair, Monterrey is Mexico's seicont richest ceety, an the warld's 63rd richest, wi an economy that haed a 2008 GDP o USD $102 billion. Monterrey is ane o Mexico's maist developit ceeties, wi the heichest per caipita income in the naition, an is regardit as a heichlie developit ceety. Although rich in history an cultur, Monterrey is aften regardit as the maist "Americanizit" ceety in entire kintra, even abuin the ceeties alang the U.S-Mexico border. ↑ 1.0 1.1 1.2 "Ubicación Geográfica". Gobierno del Estado de Nuevo León. Retrieved June 24, 2009. ↑ "2010 INEG Census Tables". INEG. Retrieved June 4, 2011. ↑ 3.0 3.1 "NAI Mexico Study" (PDF). NAI Mexico. Retrieved January 7, 2009. ↑ "Global city GDP rankings 2008–2025". Pricewaterhouse Coopers. Archived frae the oreeginal on May 31, 2010. Retrieved December 16, 2009. ↑ Contreras, Joseph (2009). In the shadow of the giant: the Americanization of modern Mexico. Rutgers University Press. p. 276. ↑ "Hamilton Ontario Sister Cities". Archived frae the oreeginal on September 26, 2007. Retrieved January 25, 2008.